Sarah’s Silks offers beautiful, colorful high-quality playsilks, toys and dress-up costumes for boys and girls of all ages that spark your little one's imagination and capture the magic of childhood. Sarah’s Silks was founded by mama Sarah Lee when her young son needed a fun costume option. Sarah notes, "I reached for an old silk scarf [and] my son loved the smooth, silky feel. Soon I found myself dyeing squares of silks to support his play.” Sarah goes on to say, "I discovered silks serve as wonderful props for almost any make-believe game. I began to think about my fellow Waldorf families searching for natural toys to enhance open ended play, and the idea evolved for a line of silk play items.” And evolve it did. Sarah's Silks has grown into a worldwide success story, with families everywhere caught up in the many benefits and play opportunities playsilks offer. Children from babyhood on up love to play with Sarah's Silks, which are silky smooth, soft and colorful, yet highly durable. 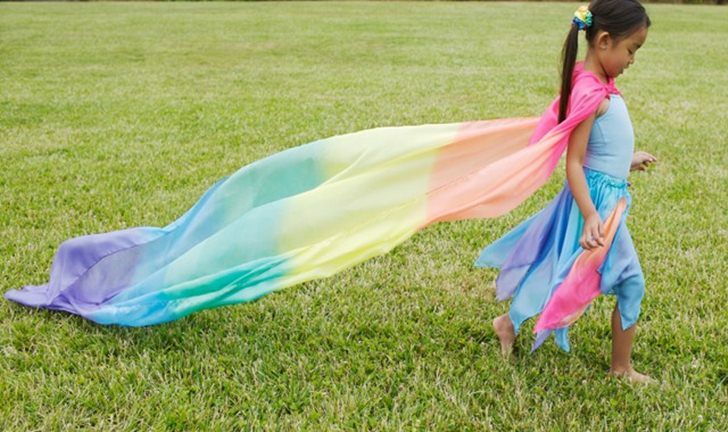 Playsilks can be used in countless imaginative ways, instantly becoming a fantastic princess gown or wizard cape or can be used to create amazing playscapes. The possibilities are endless and Sarah's Silks make the perfect gift for children year round. Keep reading to learn more about this Waldorf inspired play option. Sarah’s Silks strives to maintain green and ethical practices. Learn some facts about Sarah’s Silks below. Silk is a 100% natural fiber and a renewable resource. Sarah’s Silks dyes are non-toxic, non-hazardous, environmentally friendly, with no heavy metals. Silks are safe enough for babies, yet versatile enough for older kids to enjoy as well. All silks may be easily hand-washed. Sarah’s Silks are simple and not overwhelming for kids and these open-ended toy silks help support kids inner creativity. Sarah’s Silks gives back by donating to Waldorf schools around the world. NOTE: Though Sarah’s Silks are made in China, Sarah tells Hip Mountain Mama that, “It is important not to dismiss all “made in China ” products but rather to look carefully and see how things are made, and to see the conditions of the workers,” something Sarah’s Silks pays close attention to. Sarah’s Silks hires Chinese seamstresses to make their silks, offering incentives beyond prevailing wages as well as access to supplemental health insurance. One of the most popular uses for Sarah’s Silks are costumes. 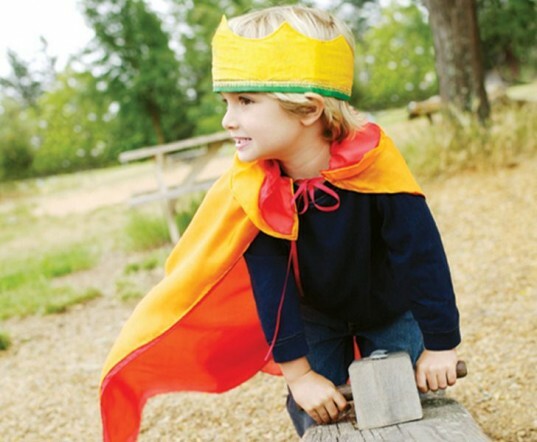 Playsilks may instantly be transformed into amazing costumes including gowns fit for royalty, dragon fighting knights, a bride’s dress, fairy skirts and wings and so much more. Silks can easily become a cape, skirt, veil, belt or tunic, depending on your child’s costume needs. As if this wasn’t cool enough, Sarah’s Silks offers a wide range of costume add-ons, such as lovely pre-made veils, tunics and dresses, along with beautiful garlands, unicorn and dragon costumes, crowns and much more. You and your child can design your own ideas using your imagination as your guide. If you’d like some clever costume ideas you can make right now, such as the adorable mermaid costume shown above, check out the post below. Sarah’s Silks come in many varieties including smaller mini silks for babies or doll play, solid colors, rainbow colors, two sided colored silks and fabulous Starry Night silks in darker colors silk screened with shining moons, stars and planets, to name a few. Sarah’s Silks also offers amazing silk scapes that are a large nine feet by three feet size. The larger size allows your child can use the silk as a canopy over a bed or to build a creative play space by draping the silk over a table, large box, puppet theater, between two chairs. You can even use these silk scapes as a window treatment. Sarah’s Silks also offers pre-made canopies, delightful Waldorf inspired toys to go with your child’s silks and even silk-made creative games. Visit Sarah’s Silks to see all the amazingly lovely toys and silks available. Sarah's Silks strives to maintain green and ethical practices. Learn some facts about Sarah's Silks below. Silk is a 100% natural fiber and a renewable resource. Sarah’s Silks dyes are non-toxic, non-hazardous, environmentally friendly, with no heavy metals. 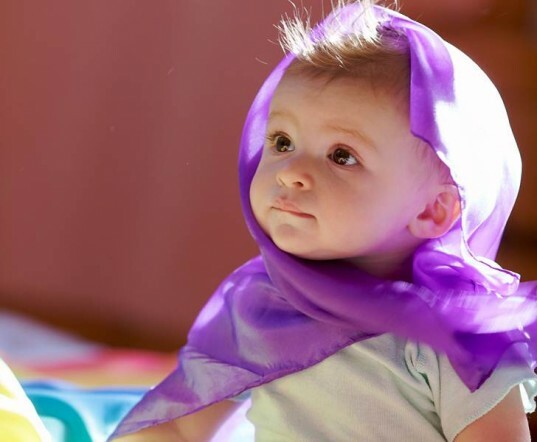 Silks are safe enough for babies, yet versatile enough for older kids to enjoy as well. All silks may be easily hand-washed. Sarah’s Silks are simple and not overwhelming for kids and these open-ended toy silks help support kids inner creativity. Sarah's Silks is a “Green America Approved Business.” Sarah's Silks gives back by donating to Waldorf schools around the world. Sarah's Silks come in many varieties including smaller mini silks for babies or doll play, solid colors, rainbow colors, two sided colored silks and fabulous Starry Night silks in darker colors silk screened with shining moons, stars and planets, to name a few. Though Sarah's Silks are made in China, Sarah tells Hip Mountain Mama that, "It is important not to dismiss all “made in China ” products but rather to look carefully and see how things are made, and to see the conditions of the workers," something Sarah's Silks pays close attention to. Sarah’s Silks hires Chinese seamstresses to make their silks, offering incentives beyond prevailing wages as well as access to supplemental health insurance. Sarah's Silks also offers amazing silk scapes that are a large nine feet by three feet size. The larger size allows your child can use the silk as a canopy over a bed or to build a creative play space by draping the silk over a table, large box, puppet theater, between two chairs. You can even use these silk scapes as a window treatment. Sarah's Silks also offers pre-made canopies, delightful Waldorf inspired toys to go with your child's silks and even silk-made creative games. One of the most popular uses for Sarah's Silks are costumes. Playsilks may instantly be transformed into amazing costumes including gowns fit for royalty, dragon fighting knights, a bride's dress, fairy skirts and wings and so much more. Silks can easily become a cape, skirt, veil, belt or tunic, depending on your child's costume needs. As if this wasn't cool enough, Sarah's Silks offers a wide range of costume add-ons, such as lovely pre-made veils, tunics and dresses, along with beautiful garlands, unicorn and dragon costumes, crowns and much more. You and your child can design your own ideas using your imagination as your guide. Sarah's Silks can be used to make countless sweet costumes. 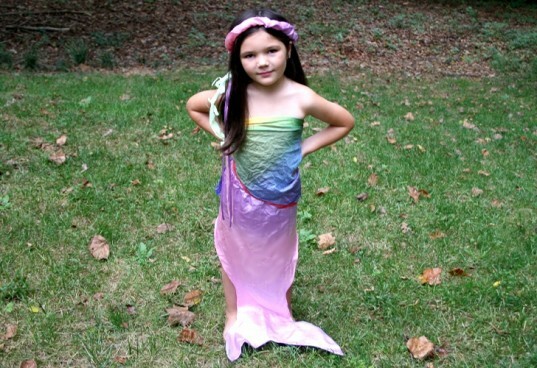 If you'd like some clever costume ideas you can make right now, such as the adorable mermaid costume shown above, read 6 Versatile Halloween Costumes From Sarah’s Silks That Will Inspire Endless Dress-Up Play. Visit Sarah's Silks to see all the amazingly lovely toys and silks available.